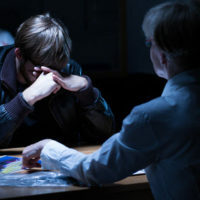 You probably know about the “Miranda warning.” Even if you don’t remember it from school, if you have ever seen a TV cop show, you understand that the police are not supposed to interrogate a criminal suspect until he or is she is advised of their rights to remain silent and have the assistance of counsel. Any confession or potentially incriminating statement obtained prior to giving such a warning may be deemed inadmissible in court as evidence of the defendant’s guilt. Even when police and prosecutors do not take Miranda warnings seriously, many judges still do. For example, the Florida Fourth District Court of Appeal in Palm Beach recently ordered a new trial for a man previously convicted of second-degree murder in connection with the 2010 death-by-stabbing of a Boynton man. The Fourth District said it was necessary to throw out a jury’s prior guilty verdict because the trial judge admitted an inadmissible statement made by the defendant prior to receiving a Miranda warning. Here is what transpired on the night of the defendant’s arrest. Local police received a call about an unspecified “disturbance” at an apartment building. When officers arrived at the scene, they saw the defendant running away from the scene. He was also bleeding from a “large cut to his neck,” according to court records. The officers pursued the defendant. They identified themselves as police and admonished him to stop. He continued to run but was caught and handcuffed by police about 10 minutes later. At trial, the jury heard both of the defendant’s statements, i.e. his false story about a black man pursuing him, and his spontaneous admission he never intended to kill the victim. The jury ultimately returned a guilty verdict on the charge of murder in the second degree. The judge sentenced the defendant to life in prison. On appeal, the Fourth District noted there was no dispute the defendant was “in custody at the at the time he gave both of the challenged statements” and that he had not received a Miranda warning. But as the Court explained, that did not mean both statements were inadmissible. Indeed, the Court said only the first statement was inadmissible since it was given in direct response to a police question–“Why are you running?” Even though the defendant lied, that was used against him at trial. Conversely, when the defendant said he “didn’t mean to kill” the victim, that “was not the result of any law enforcement question or confrontation.” It was “uttered spontaneously” by the defendant. The trial judge was therefore allowed to let the jury hear it. If there’s a key takeaway from this case, it’s to just keep your mouth shut once the cops arrive and start asking you questions. Always assume that anything you say will be used against you even if you have not received a Miranda warning. And if you are considered a suspect by the police and need advice from an experienced Miami criminal defense attorney, contact the Law Office of Julia Kefalinos today.